Home / QuiBidder of the Week – Tiffany E.
Congratulations to Tiffany E., QuiBids’ newest QuiBidder of the Week! 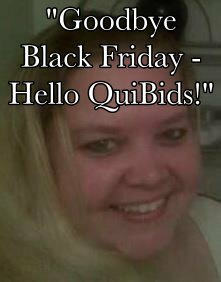 Tiffany is new to QuiBids, and she has already started winning holiday and birthday gifts for her family. Tiffany also understands the importance of utilizing the Buy Now feature if she doesn’t win an auction. “(T)he Buy Now feature is priceless. I don’t feel like I’m losing money, rather aiming for discounts on products I’d already be buying.” We couldn’t have said it better ourselves! Be sure to join us in congratulating Tiffany in the comments section below. You can read her full QuiBids story below. Need more info? Check out the QuiBidder of the Week Guidelines. Don’t forget to leave a friendly gesture in the comments below and congratulate Tiffany.